Two dozen Army, Navy/Marine and Air Force ROTC cadets from the University of Mississippi will arrive by van in Calhoun City Monday morning (Nov. 19) on a mission to retrieve the ceremonial game ball for the 91st Battle for the Golden Egg, but it will be their feet that bring them home to Oxford. 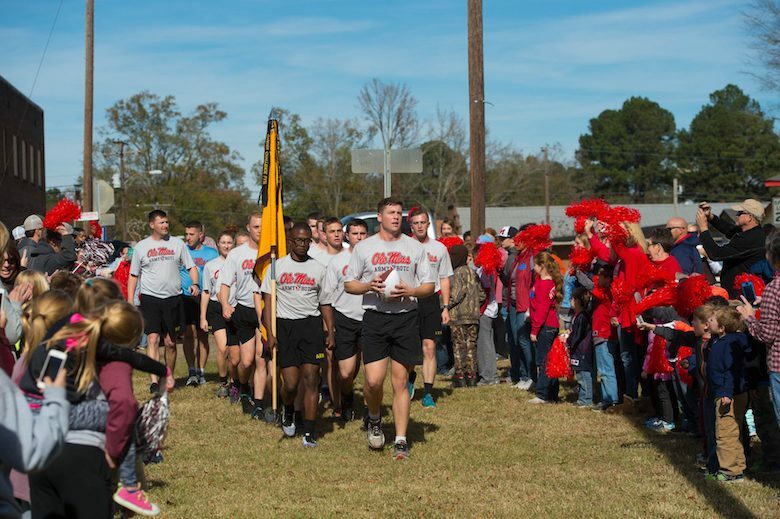 The ROTC’s Sixth Annual Egg Bowl Run will feature Ole Miss cadets taking turns trekking more than 40 miles, from the Calhoun City town square to the Lyceum, with the game ball in tow after receiving it from cadets from Mississippi State University. The transfer of the ball is to occur around noon at the gazebo in the Calhoun City public square. The football will be signed by MSU coach Joe Moorhead, and Ole Miss coach Matt Luke will sign the ball after the cadets return it to Oxford. Waiting in Calhoun City will be residents of the town, as well as fans who come from all over Mississippi to see the cadets meet, circle the town square with the ball, trade cheers and friendly trash talk, and eventually part, heading back to their respective universities. The Egg Bowl Run began in 2013 as a way for Ole Miss ROTC to show its support of Ole Miss athletics. The event serves as a fundraiser for the Rebel Battalion Cadet Activity Fund. Supporters can visit the Army ROTC Facebook page, where a link will be posted to direct people to a donation website. “Our cadets think this run is so important,” said Sgt. 1st Class Anthony Douglas with UM Army ROTC. “These cadets run in rain and sleet without ever complaining or feeling sorry for themselves. Laura Edwards, president of the Calhoun City Chamber of Commerce, said the event usually hosts some 500 fans, split down the middle between each school. Fans host tailgates, and there are activities for all ages. The National Guard provides an interactive military display for children and adults to enjoy. Along the run back to Oxford, Ole Miss cadets greet fans and supporters, sometimes passing out candy to children along the route, Faulkner said. The tradition is catching on with Ole Miss fans, and support continues to grow, Douglas said. And while the focus of the Egg Bowl often remains on the football field, Edwards said the Egg Bowl Run is a way to shift the attention to those who will serve the country. “Our military doesn’t always get the thanks and notoriety that it should,” she said. “I think we need to keep that on the forefront of our children’s minds. They need to understand that freedom isn’t free. Cadets see the run as a good chance to connect with not only their own classmates, but also with counterparts from MSU. Douglas said he hopes Ole Miss supporters will show Calhoun City and the Ole Miss cadets a true Rebel football atmosphere. MSU cadets will leave Starkville at approximately 5 a.m. Monday. They will meet and exchange the ball with Ole Miss cadets around noon, and then Ole Miss cadets will return to campus and take the ball to the Lyceum about 9 p.m.
Times may vary, but a link will be shared on the Army ROTC Facebook page where fans can keep track of the runners’ progress via GPS, Douglas said.